I was thinking about you today. I was thinking about how badly you want to make mini pies, but how you don’t have mini pie tins, and therefore you’ve been walking around depressed due to your lack of mini pies. So I came up with a soultion for you! 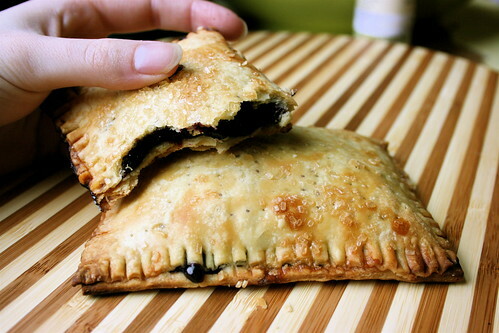 Hand pies! No tins required. You can use whatever filling you want. Really. Blueberries, strawberries, apples, pears, whatever floats your boat. 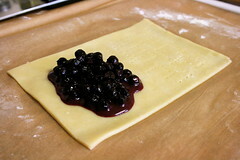 If it’s juicy (like berries) add a couple tablespoons of cornstarch so the filling thickens as it bakes. You could even do a more savory filling like sweet potatoes if you want. Or if you don’t have time for cutting fruit or mixing berries and sugar, use your favorite jam or preserves. I won’t tell. Make and chill dough (click on the link in the ingredients for directions). Roll out 1 disc of dough to about 1/4″ thick. 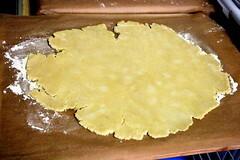 It’s much easier to do this on a large cutting board that has been covered in parchment paper and lightly floured. If the dough rips, press it back together with your fingers. Cut two rectangles out of the dough. It doesn’t really matter what size they are, since you’re going to roll them out again and make them larger, but mine were about the size of index cards. Roll out a rectangle again to its final thickness, about 1/8″ thick. That’s thin enough that the dough begins to become slightly translucent, but thick enough that you can still pick up the dough without ripping it. Use more flour as you’re rolling the dough out if you need to. 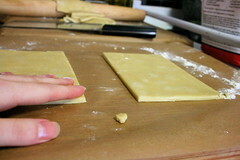 Trim the dough again into a neat rectangle. Again, size isn’t important, so go for whatever size appeals to you. I wanted my finished pies to be the same size as pop tarts, so I guestimated the height (5 inches?) and the width (7inches?) and rolled out the dough accordingly. This will make a 3.5×7″ pie once it’s filled and folded in half to close. Prick one half of the dough with a fork, and place two tablespoons of filling on the other half. Pricking the dough helps it bake more evenly, preventing dough bubbles. You could cut out little shapes as vents instead if you want, but the filing will bubble up and out of any large holes. 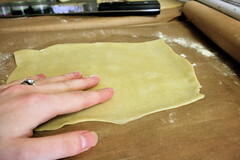 Fold the dough over the filling and press closed with your fingers to seal. 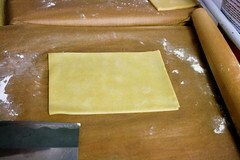 Then use a fork to crimp the edges. It’s okay if some juice escapes, but try to keep it at neat as possible. 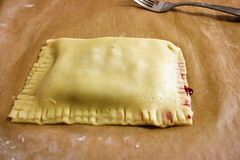 Use a spatula to pick up your hand pie and place on a baking sheet covered in parchment or lined with a silpat. Repeat these steps, rolling, cutting and filling, until you run out of dough. Lightly brush each pie with soymilk and sand with sugar. * Bake the pies for 18-20 minutes until golden brown. Cool slightly on a wire rack and serve warm. *If you want to freeze these and then reheat them in a pop-up toaster like poptarts, skip the sugar so it doesn’t burn up when you toast it. If you’re going to use a toaster oven, you can sugar them or frost them with a simple powdered sugar and soymilk glaze. 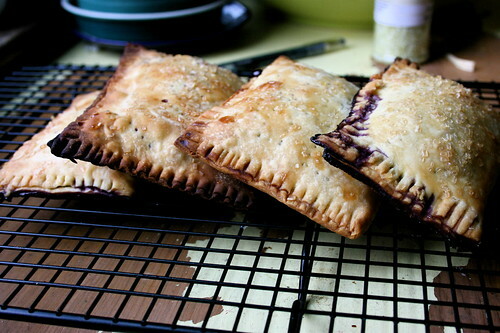 Keep an eye on them while baking – escaped berry juice and tender, flaky edges burn quickly when you’re not looking! Ours didn’t last long enough to save for later, but they will keep at room temperature for a few days if stored in an airtight container. WOW! I want some of those….you are a genius! Mmmm. Thanks for thinking of “me” today. I’ll be thinking of you soon while I’m drooling over one of these! That’s one of the most beautiful pies I’ve ever seen. I love blueberries! Thank you very much for this Recipe. I made this yesterday and it came out really great! My boyfriend and I love it. I love your recipes, I always look foward to see your new Recipes. Thanks! those little numbers look so beautiful and so t-a-s-t-y!!! OH my goodness, we are trying to use up what is in our freezer and I just found a bag of blackberries. These pies are the answer on what to do with them. Yeepeee! Made these today. AWESOME and EASY! Thanks! June 18, 2007 - 12:34 pm Pingback: AllMenus.com Blog » Blog Archive » Blueberries! Don’t Get Me Started. I just discovered this blog and… wow. It’s amazing. So beautiful, and the recipes themselves look awesome. Hi there. Wonderful recipe. I have done it with cherries, blackberries, even peaches, and it comes out wonderful. I am not Vegan, but always find good recipes on vegan sites. I sell these at flea markets and find my customers love em. Kudofor the wonderful stuff. CHEERS! these look so wonderful! am wondering whether you know how to make the pie crust without cane sugar. any ideas? I love to bake but am unsure about how to swap say maple syrup for sugar when baking. i am obsessed with your website and have sent the link to two friends already! my one friend made your seitan salad from last week and my other is considering veganism and your blog i think may push her over the edge! just beautiful photos and inventive but approachable recipes. i look forward to the possibility of a new post each time i go online. thanks! I made these last August, and they were SO much work. And weren’t nearly as pretty as yours. They exploded and a lot of my blueberry filling leaked out. BUT they were really yummy though and my boyfriend and I ate the whole batch very quickly. I think I will have to try and make them again because they were so good. This recipe turned out great! I used two different types of fillings for diversity, and to use up the last of my overabundance of fruit! One was pear and I used brown sugar, cinnamon, nutmeg, cloves, a touch of ginger and a little lemon. For the other filling I used plums with only sugar and lime juice. I agree with you Mary, there was no instruction on the filling, but I just cooked the fruit with sugar, a bit of water and corn starch in a sauce pan on low, like making a pie filling. Then cooled the filling before adding it to the dough. I made too much unfortunately… or maybe, I’ll just have to make another patch of dough and more pies?! Teresa, these are time consuming! I agree it took me longer than making a pie but really, I look at it like I just made 20 pies! Each one is individual, mini and ready to eat with no clean up or fuss. So the amount of time you took making each little pie you save in washing a dish from the slice of pie you would be serving. I am going to these pies to a picnic and know I am being Green, with no extra trash from disposables. For those of you about to start a batch consider a few other tips. First try to get the air out of the pie before you seal the edges or you will get an ugly bubble on the inside. Finally, seal those puppies tight. I’m a fan of yours. Those pies are traditional finnish cuisine but they’re not vegan. It’s not hard, though, to make them vegan. I’ve made these a couple times before and they’ve become my go-to easy quick dessert. I’m not vegan, so I use frozen puff pastry, which makes it take about 10 minutes to put together. I just quit my job and as my last day hoorah, I’m going to serve these to my co-workers. One batch of blueberry, and one batch of apple with ground gingersnaps, pecans, and brown sugar. Can’t wait – and Thank You for this recipe! Hi. I too just discovered you!…and thanks for the GREAT recipes here. We have a college student staying with us who is vegetarian and we have been shifting that way as well. He’ll LOVE these pies, great for on the go college guy. Thanks for doing this! It says you can freeze them and then reheat them in a toaster oven. Does that mean freeze them unbaked and then bake them, following the directions, or do I bake them and then freeze them and then reheat them?? Oh my God, I love blueberries and I love filled things. When our oven gets fixed, I am making this First Thing. What a great idea! Awesome recipe!!!! I’m just starting out as vegan and this is really helping. 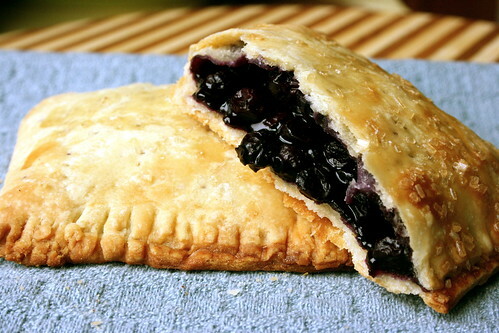 Mmmmm… I made these with the last bag of blueberries from the summer and they were delicious!!! Be generous with the sugar on top! Those look yummy :) I’ll have to make them sometime! I met the Juliet Mae Spice owner Kathy Fitzhenry at the Marin Farmers Market. At first I thought they sold teas, then I thought it was spice for eating flesh. Not so much. Yes, she sells meat spices but she also sells great spices and herb blends for vegetarians. She is like non judgmental either way, though I do talk to her about supporting certain negative behaviors like eating meat. Anyway check out Juliet Mae. I hate the fact that it , once I press print , that it takes 12 pages of my expensive ink to get this recipe . Thanks a bunch guys ,aren’t you cool !!! I have made this before and it is such a great and easy recipe to do. My fiancee is a vegan and I am vegetarian. I love baking, and he loves it when I bake these. So thanks a bunch! And Ron. Highlight what you print and then when you go to print click Selection before you print. I tried it out and it was pretty much a failure the first time. I had the same problem of the blueberries leaking out! But I was determined! Next time I just made the dough thicker and it worked great and tasted amazing! I added a little glaze to mine to give it a little kick :)! Ahhh, gimme one of those – now! They look fantastic! How do you make the filling? I imagine you cook it down with all of the ingredients? Or do you just thaw the fruit, combine and voila? these look so great, but I don’t like blueberries….Do you know any variations with apples?